Background: Fracture of the distal end radius constitutes one of the most common skeletal injuries treated by the orthopedic surgeon. Wide arrays of techniques have been described including closed reduction, percutaneous fixation and open methods of reduction, and stabilization. Displaced extra- or intra-articular distal radius fractures require accurate reduction to allow a good outcome. We assessed the outcome of volar plate osteosynthesis and compared its outcome with other methods of treatment to confirm satisfactory reduction and functional outcomes. Materials and Methods: Prospective study conducted in our medical institution between 2012 and 2013. Inclusion criteria included skeletally mature patients who presented to casualty with fractures of the distal radius. Closed reduction cast application/K-wire fixation/open reduction and internal fixation with a volar plate was done under general anesthesia in 60 patients (20 cases each). During the follow-up, radiological and functional parameters were assessed and Gartland and Werley scoring was done. Results: Patients with volar plate fixation had a better outcome than the K-wire fixation and cast application. Radiological parameters were well-maintained, and functional parameters showed a significant improvement during the follow-up period. The complication rate was less and insignificant. Conclusion: Primary volar plate fixation of unstable distal radius fracture provides a stable construct that helps in early mobilization, thereby better functional outcomes and minimizes chances of delayed/malunion and, thereby is an upcoming method of choice for fracture distal end of radius. The present study comprised of 60 patients of distal radius fractures in 20 patients treated by plating, 20 by cast application and 20 by K-wire application. The minimum follow-up was 8 weeks, and the maximum was 36 weeks. This study was undertaken to assess the functional outcome of operative management of distal radial fractures and the following conclusions were drawn - male patients predominated female patients (36 males to 24 females) and average age of patients is 46.01 years. Left sided fractures were more common (61.6%). Road traffic accident was the commonest cause of the trauma (73.3%). AO 23 A-2 was the most common type of fracture, accounting for (26.6%) with Associated injuries seen in 4 patients (6.6%). Functional outcome as per Gartland and Werley was 3.75 for plating, 8.6 for cast application, and 7.55 for K-wire fixation. About 90% excellent to good results were observed in plating group as compared to 55% in cast and 65% in K-wire fixation in demerit score. Complication such as irregular articular surface, wrist pain, finger stiffness, K-wire loosening was observed. 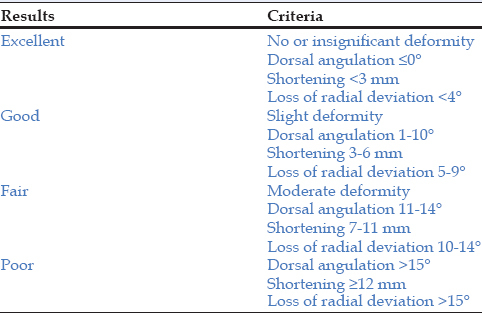 Thus, based on this study, we conclude that volar plating has relatively better outcome for distal end fractures of radius particularly volar Barton fractures, with minimum chance of loosening of implant even in highly comminuted cases and cases having osteoporosis. In the early 1950s, James Ellis from England started using a specially designed T-plate to buttress the small marginal fragment in volar Barton's fractures. In 1970s, the AO group designed plates specifically for the treatment of distal radius fractures. There are two types of plates for fractures of the distal radius: (a) Conventional plates and (b) fixed angle locking compression plates. As open reduction and volar plating ensures more consistent correction of displacement and maintenance of reduction. This study evaluates the anatomical and functional outcome of open reduction and plate fixation in the management of fracture distal end radius and its comparison with other modalities of treatment. The objectives of our study are to assess the outcome of volar plate fixation and its comparison with other modality of fixation. The study was a prospective study carried between June 2012 to September 2013 on the patients with fractures of the distal end radius, attending the outdoor and the emergency services of the Department of Orthopaedics in our institution. Of 294 patients who had fractured over distal radius 60 cases were recruited in our study. All the patients with extra-articular (AO 23-A2, 23-A3) distal radius fracture were treated with cast, K-wire, and volar plating. The inclusion criteria were >15 years of age and the patients presented within 48 h of injury, patients who did not have other associated fractures in ipsilateral upper limb and the patients who gave their consent to undergo the procedure. Randomization was done by Lottery method. The exclusion criteria were patients with co-morbid conditions such as head injury, or chest injury preventing surgical intervention, or making patients noncompliant for postoperative physiotherapy and follow-up, patients with local tissue condition making the surgery inadvisable. All the patients were subjected to clinical examination and on last follow-up they were assessed according to the demerit point system of Gartland and Werley with Sarmiento et al. 's modification [Table 1]. Radiographic evaluation was also assessed on the basis of criteria for the anatomical result after Sarmiento [Table 2] and [Figure 1]a-f. The present study comprised of 60 patients of distal radius fractures in 20 patients treated by plating, 20 by cast application, and 20 by K-wire application. The minimum follow-up was 12 weeks and the maximum was 36 weeks. Male patients predominated female patients (36 males to 24 females), and the average age of patients is 46.01 years with the range being 25-83 years. Left sided fractures were more common (61.6%). Road traffic accident was the commonest cause of the trauma (73.3%). AO 23 A-2 was the most common type of fracture, accounting for (26.6%) with associated injuries seen in 4 patients (6.6%). Restoration of radial length, radial inclination, and volar angle was best achieved in volar plating group [Table 3]. The average range of movement at the wrist as per Gartland and Werley was 3.75 for plating, 8.6 for cast application, and 7.55 for K-wire fixation [Table 4]. Using the demerit score system of Gartland and Werley, we had 14 (70%) excellent results in volar plating, 4 (20%) in cast, 4 (20%) in K-wire fixation, 4 (20%) good results in volar plating, 7 (35%) in cast, 9 (45%) in K-wire fixation, 2 (10%) fair results by plating, 8 (40%) in cast, and 7 (35%) in K-wire fixation. There was only 1 (5%) patient with poor result treated by cast application. The statistical outcome was assessed by the one-way ANOVA, applying the Chi-square test and statistically significant variation was found giving a positive P value [Table 5]. Complication such as irregular articular surface, wrist pain, finger stiffness, and K-wire loosening was observed. Overall results with plating were better as compared to other groups followed by K-wire fixation and cast application. Distal end radius fractures are the most frequently seen upper extremity fractures. As far as the treatments of these fractures are concerned, it is one of the most challenging types. The main objective of treatment is to re-establish anatomic integrity and function. It has undergone changes owing to the advances in technology. Improved imaging methods provide better understanding of fractures and elucidation of the effects of the injury type on fracture formation and factors that lead to instability. In our study, the distal radial fracture was more common in the 3 rd and 5 th decade with an average of 46.01 years. It is comparable with other similar studies , done earlier who have concluded the same. There was no statistical significance in the findings which points that there was no selection biased in the studies. Our study had a male preponderance, which are similar to other studies. , Increased incidence in males is probably due to their involvement in outdoor activities, riding vehicles, and heavy manual labor. Left side was involved in 37 patients and the right side was involved in 23 patients in our study; however, in other studies, , the right side was more predominantly involved but at the same time they have inferred that statistically there is no significance of side involvement in the study. AO 23 A-2 fractures were the most commonly encountered fractures in our study. Four patients (6.66%) of patients in our study had associated injuries. However, there is no significant statistical significance of the same in either of the study group. 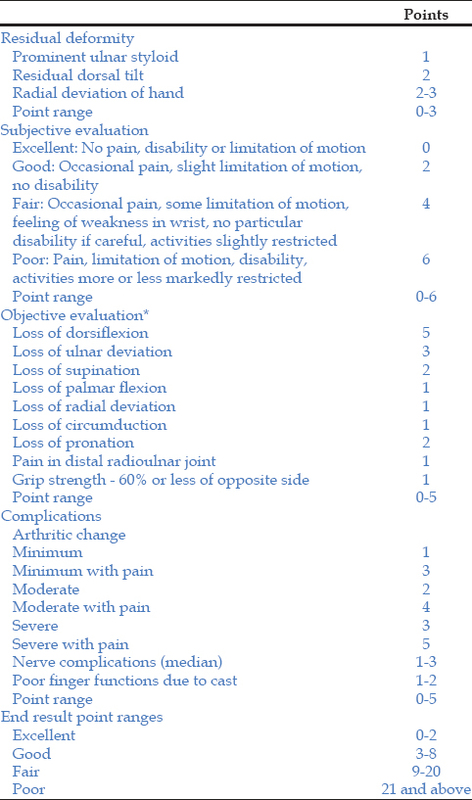 The final assessments of results were made using the demerit score system of Gartland and Werley based on objective and subjective criteria, residual deformity, and complications. Overall results with plating were better in comparison to other groups, followed by K-wire fixation and cast application. The various studies were conducted on therapeutic effects of volar anatomical plates versus locking plates for volar Barton's fractures and evaluated wrist according to Sarmiento et al. 's  modification of the Gartland and Werley  system and the DASH and the results showed an excellent and good rate of 75% in the anatomic plate group and 94.1% in the locking plate group, similar to those reported in the literature. The mean modified Gartland and Werley score in the locking plate group. The locking plate has relatively better efficacy for volar Barton's fracture, but loosening of the implant is seen in highly comminuted fracture cases and cases with osteoporosis. The samples were not homogenous in term of classification and other factors while comparing the results of different methods. It was further noted that cases with less degree of comminution and instability are bound to have a good result when treated with closed reduction cast immobilization or fixation by K-wire. Fracture of distal end of radius with or without involvement of articular surface when treated with volar plate fixation have significantly better outcome over other methods such as cast immobilization and K-wire fixation in terms of restoration of anatomy and function. This is due to better stabilization of fracture fragments which allows early mobilization of joints around together with muscle strengthening exercises. Our study had some limitations. The sample was not homogenous regarding the stages of classification system for comparison by different method of treatment and, therefore, the findings are inconclusive. The sample size of our study is limited to one center and is small to conclude very effectively. Many patients who were planned for plate osteosynthesis were managed by cast or K-wire due to financial constraints. Thus, based on this study, we conclude that volar plating has relatively better outcome for distal end fractures of radius, particularly volar Barton fractures, with minimum chance of loosening of implant even in highly comminuted cases and cases having osteoporosis. Colles A. On the fracture of the carpal extremity of the radius. Edinb Med Surg 1814;10:182-6. Fitoussi F, Ip WY, Chow SP. Treatment of displaced intra-articular fractures of the distal end of the radius with plates. J Bone Joint Surg Am 1997;79:1303-12. Mallmin H, Ljunghall S. Incidence of Colles′ fracture in Uppsala. A prospective study of a quarter-million population. Acta Orthop Scand 1992;63:213-5. Dóczi J, Renner A. Epidemiology of distal radius fractures in Budapest. A retrospective study of 2,241 cases in 1989. Acta Orthop Scand 1994;65:432-3. Solgaard S, Petersen VS. Epidemiology of distal radius fractures. Acta Orthop Scand 1985;56:391-3. Larsen CF, Lauritsen J. Epidemiology of acute wrist trauma. Int J Epidemiol 1993;22:911-6. Bacorn RW, Kurtzke JF. Colles′ fracture; a study of two thousand cases from the New York State Workmen′s Compensation Board. J Bone Joint Surg Am 1953;35-A:643-58. Cao J, Ozer K. Failure of volar locking plate fixation of an extraarticular distal radius fracture: A case report. Patient Saf Surg 2010;4:19. Gerostathopoulos N, Kalliakmanis A, Fandridis E, Georgoulis S. Trimed fixation system for displaced fractures of the distal radius. J Trauma 2007;62:913-8. Crenshaw AH Jr. Fractures of shoulder, arm, and forearm. In: Campbell′s Operative Orthopaedics. Part XV. 11 th ed., Vol. 3. Ch. 54. Philadelphia: Mosby Inc.; 2008. p. 3447-9. Cognet JM, Geanah A, Marsal C, Kadoch V, Gouzou S, Simon P. Plate fixation with locking screw for distal fractures of the radius. Rev Chir Orthop Reparatrice Appar Mot 2006;92:663-72. Adani R, Tarallo L, Amorico MG, Tata C, Atzei A. The treatment of distal radius articular fractures through lcp system. Hand Surg 2008;13:61-72. Pichon H, Chergaoui A, Jager S, Carpentier E, Jourdel F, Chaussard C, et al. Volar fixed angle plate LCP 3.5 for dorsally distal radius fracture. About 24 cases. Rev Chir Orthop Reparatrice Appar Mot 2008;94:152-9. Leung F, Zhu L, Ho H, Lu WW, Chow SP. 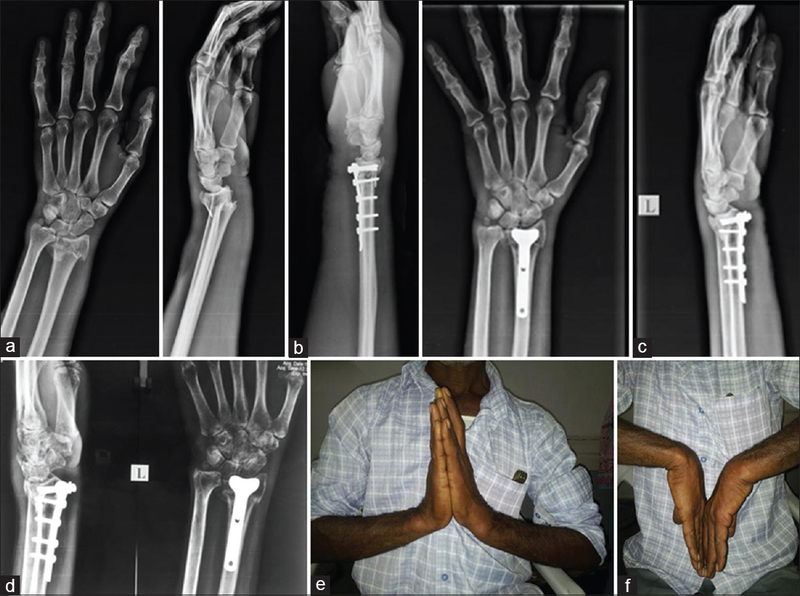 Palmar plate fixation of AO type C2 fracture of distal radius using a locking compression plate - A biomechanical study in a cadaveric model. J Hand Surg Br 2003;28:263-6. Chen NC, Jupiter JB. Management of distal radial fractures. J Bone Joint Surg Am 2007;89:2051-62. Cooney WP 3 rd . Fractures of distal radius: A modern treatment - Based classification - Distal radius fractures. Orthop Clin North Am 1993;24:211-6. Kiliç A, Kabukçuoglu Y, Ozkaya U, Gül M, Sökücü S, Ozdogan U. Volar locking plate fixation of unstable distal radius fractures. Acta Orthop Traumatol Turc 2009;43:303-8. Othman AY. Fixation of dorsally displaced distal radius fractures with volar plate. J Trauma 2009;66:1416-20. Anakwe R, Khan L, Cook R, McEachan J. Locked volar plating for complex distal radius fractures: Patient reported outcomes and satisfaction. J Orthop Surg Res 2010;5:51. Kiernan C, Brennan S, McInerney N, Judzan M, Kearns S, Sullivan MO. Volar Locking Plate Versus K-Wiring Fixation of Distal Radius Fractures in 20-65 Year Olds. In: Irish Journal of Medical Science. Vol. 181. 236 Grays Inn Rd, 6 th Floor, London Wc1x 8Hl, England: Springer London Ltd.; 2012. p. S189. Rizzo M, Katt BA, Carothers JT. Comparison of locked volar plating versus pinning and external fixation in the treatment of unstable intraarticular distal radius fractures. Hand (N Y) 2008;3:111-7. Orbay J, Badia A, Khoury RK, Gonzalez E, Indriago I. Volar fixed-angle fixation of distal radius fractures: The DVR plate. Tech Hand Up Extrem Surg 2004;8:142-8. Ruch DS, Papadonikolakis A. Volar versus dorsal plating in the management of intra-articular distal radius fractures. J Hand Surg Am 2006;31:9-16. Simic PM, Robison J, Gardner MJ, Gelberman RH, Weiland AJ, Boyer MI. Treatment of distal radius fractures with a low-profile dorsal plating system: An outcomes assessment. J Hand Surg Am 2006;31:382-6. Sarmiento A, Pratt GW, Berry NC, Sinclair WF. Colles′ fractures. Functional bracing in supination. J Bone Joint Surg Am 1975;57:311-7. Gartland JJ Jr, Werley CW. Evaluation of healed Colles′ fractures. J Bone Joint Surg Am 1951;33-A:895-907.